It's only March 31, but Netflix is all over April Fools' Day. But instead of lightly mocking its own products, like it did with last year's anti-binge-watching PSA, the billion-dollar company's 2017 prank takes aim at one of its biggest tech-scene rivals: Facebook. Yep, if you love Facebook Live, get ready for Netflix Live. The nearly hour-long gag, which is available to stream now, is centered around mundane, mind-numbing activities like watching a copy machine, a microwave, and a toaster in the Netflix corporate office. What's the big twist? 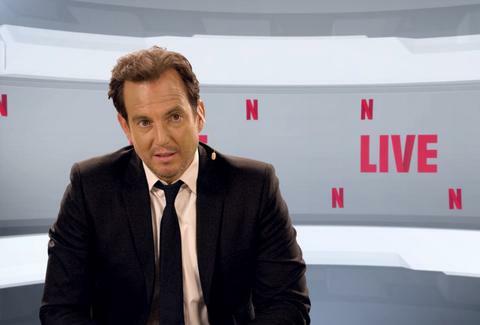 Gravel-voiced Netflix utility player Will Arnett (Arrested Development, BoJack Horseman, A Series of Unfortunate Events, Flaked) provides rambling, absurd narration to all the super-boring action. Hopefully the video also has some club sauce in it. If you're not a fan of Arnett, rest assured that other Netflix stars also stop by for some silly cameo appearances. At one point, the company's resident movie star Adam Sandler faces off in a game of thumb-wrestling against Barb from Stranger Things. The whole thing is pretty silly, like an Adult Swim bit stretched to jumbo-sized Netflix length, but the decision to skewer one of its competitors' video strategy gives the video some (very mild) bite. Is it binge-worthy? Not quite. It's the type of thing you'll play for 10 minutes at work then forget about. At least until next year when the company plays "gotcha!" again.